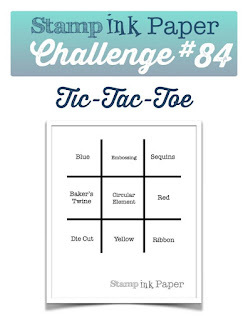 Tina's Crop Shop: SIP Challenge #84 Tic-Tac-Toe - Otterly Love You! Hello and Happy Tuesday! 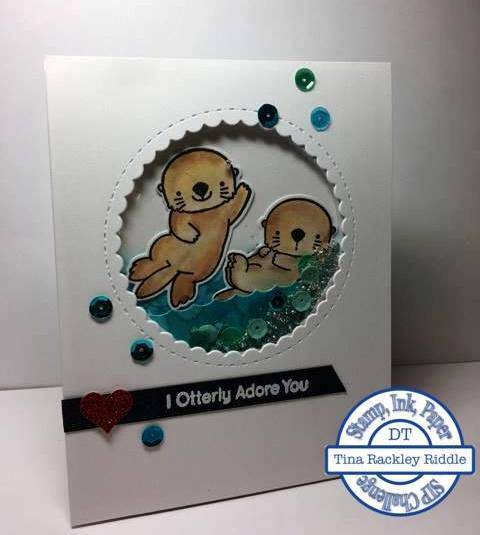 I'm super excited today because I was able to use this week's Stamp, Ink, Paper Challenge Tic-Tac-Toe with my brand new MFT Otterly Love You stamp set from the Stamp, Ink, Paper Store! I ordered this set last Friday and received it Monday! I call that great service!!! So for my tic-tac-toe, I went straight across the top row with Blue, Embossing and Sequins! If you know me at all, you know I love shaker cards! Well how could I not turn this adorable little otter set into a shaker! This was super fun to make! For my water I sponged Broken China and Peacock Feather Distress Ink onto Bristol Smooth Cardstock and then spritzed with water and dabbed it with a paper towel. For my otters, first I stamped them with MFT Hybrid Black Ink onto Bistol Smooth Cardstock and then clear embossed them. I used Antique Linen an Vintage Photo Distress Inks to watercolor them. I'm really beginning to enjoy watercoloring with my distress inks! Here's a list of the products used! Too cute! Love the water you made! Get Out! This is the just the cutest ever!